These broadcasts feature multi-layered sound effects; the actors used accurate police lingo, abbreviations, and penal codes; and the show didn't shy away from stories about heinous crimes or stories that had unhappy endings. Created and produced by Jack Webb, Dragnet was much more than "just the facts". 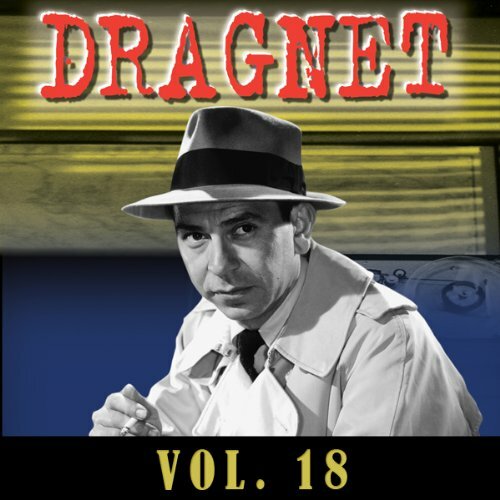 Fact: you can download more collected volumes of Dragnet, and you can pick up the individual episodes. There are 6 episodes in this collection. If you can't find the link to search for the Dragnet Collections then search for DragCOL instead. I've listened to Dragnet for years. These volumes appear as single editions in your library. Most of them have great sound quality. Because each story is individual you will not see reviews on the whole volume very often. Most reviews are on each story. Most original radio episodes were sponsored by cigarette companies. Sometimes a plug for the cigarettes is made by Jack Webb, the primary voice of Dragnet, sometimes other celebrities will join the list of promoters. There are a few extra comments such as to attend church each week, become active in your community, serve on jury duty and even one which recommends reading your Bible during National Bible Week. Each episode has a story of crime and punishment, most have a twist for the culture of the 1940s and 1950s. Most stories could happen today. Heroin, drug use, stealing, forgery, murder - nothing different from our local news, what is different is leaving a dime for use of the phone, lunch plates costing $2, offering smokes to every person they meet along the way. Police officers can no longer afford to keep everyone in cigarettes the way these are passed out. The radio crimes are less violent because language that could cross the airwaves was limited and could not use slang or street terms. This makes Dragnet episodes suitable for all ages. Worthwhile and certainly a great value when you consider the price and how many hours you get of listening. Dragnet is awesome!